The Royal Swedish Academy of Sciences, V.M.J. Henriques (sunspot), NASA Apollo 17 (Earth). 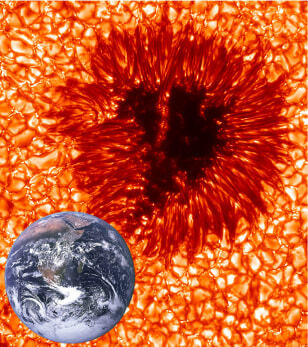 An image of the sunspot with the Earth shown to scale. The image is colorized for aesthetic reasons. This image with 0.1 arcsecond resolution from the Swedish 1-meter Solar Telescope represents the limit of what is now possible in terms of spatial resolution.